I get tips on restaurants to try from a lot of different sources: word of mouth, the internet, email. I can't act on a lot of them. But when Jersey Girl tells me to check out a place, I listen. She's not just a fellow foodie, but a killer cook as well. 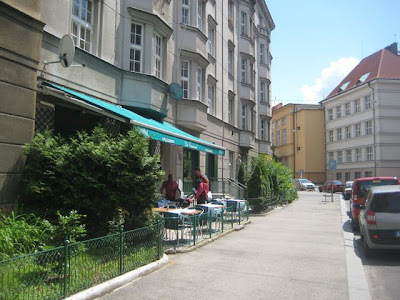 On her advice, we went for Sunday lunch at Da Emanuel, an Italian eatery in Prague 6. The weather was running hot and cold, but we got a table outside in the small space in front of the restaurant. It's on a relatively quiet residential street. As the sun moved in and out of the clouds, our sweaters were on and off several times during the meal. 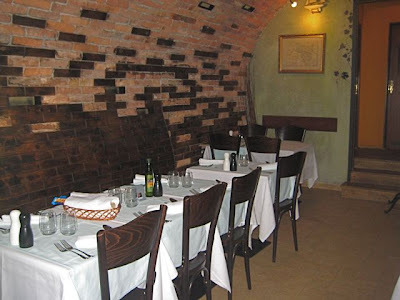 The inside dining area was also quite small, but looked nice and intimate, with a vaulted brick ceiling. Maybe too intimate. The tables were quite close together. 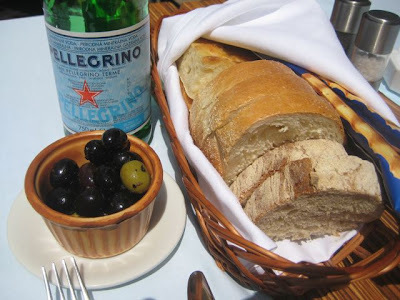 The waiter brought a bread basket with a variety of nice slices, including good focaccia. There were tasty green and black olives. We were given a bottle of olive oil. But no plates. And no napkins. And no knives or forks. These all came much later, after we asked the waiter if we could have some. We ordered a big bottle of mineral water. It was San Pellegrino (95 CZK each). I always find it strange that they ask you if you want it with bubbles or not, but you never know what brand you are going to get. Later, we ordered a second bottle, but it did not come until V reminded the waiter. 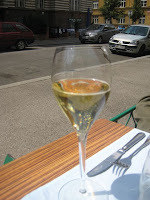 V had a glass of prosecco (85 CZK each). Later, she ordered a second glass, but it did not come until she reminded the waiter. We put our food order in just before a table of regulars who got welcome kisses from the waiter. The kitchen was not moving too quickly, and V was really steamed when their food came out 10 minutes before ours. For a starter, V got the grilled calamari (250 CZK). It was excellent. 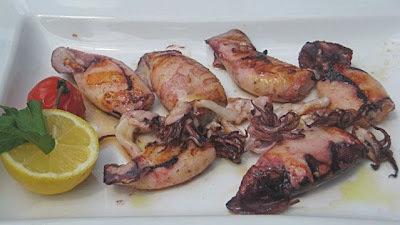 The small squid were super-fresh and cooked just right -- not too long -- so it was very tender. It also had a light char from the grill that added to the flavor. It was great with just a little lemon and olive oil. I ordered the Caprese salad (200 CZK). I was in the mood for it, but felt guilty I wasn't trying something more adventurous. However, I was surprised how much I liked it. 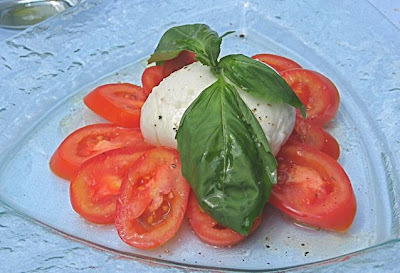 The bufala mozzarella ball had an amazingly creamy interior, with a fresh, clean tang to it. The tomatoes, which in Prague are often a watery, flavorless disaster, actually tasted like tomatoes. I added only the smallest splash of balsamic on the side, but it really didn't need it. 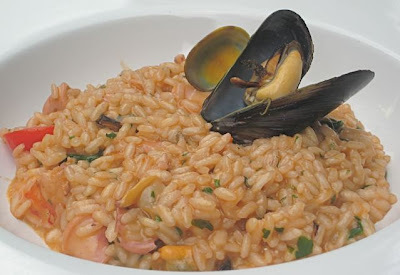 For a main course, I had a dish that I try at almost every Italian-Mediterranean restaurant: risotto frutti di mare (280 CZK). It included chunks of quality shrimp, calamari, mussels and clams. Very fresh. I thought it was OK but on the bland side. I added salt and asked for extra lemon to get it closer to where I wanted it to be. V had the linguine with shrimp and zucchini (250 CZK). She declared it to be the best version of this dish in Prague. And she's had many. Why so good? The flavor of the large shrimp was perfect. It tasted like it had just come out of its shell, not a freezer bag. 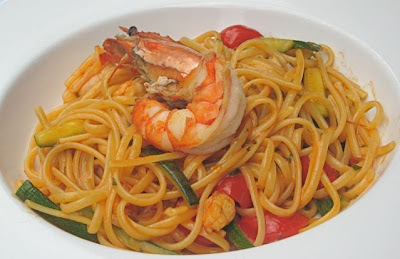 In addition to the big crustacean on top, there were good-sized chunks mixed into the pasta along with tomatoes. The pasta itself had also absorbed plenty of the shrimp flavor. We debated whether the shrimp were overcooked. I found them a little on the tough side and said yes. V thought they were just right and said no. For dessert, I had the house-made tiramisu (110 CZK). 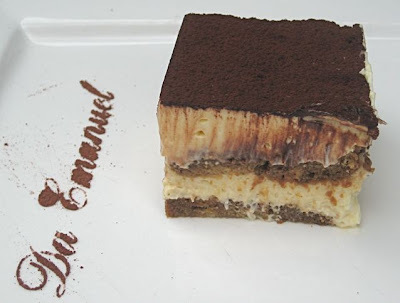 It hit all the right tiramisu notes, and I liked it, but I wouldn't use any superlatives to describe it. V had an espresso with milk (45 CZK). We thought the food was great, and we definitely plan to return for more. I saw a tagliatelle dish with Italian sausage go by to another table that I really want to try. The bill for our lunch was 1495 CZK. Expensive, but not bad for top notch food and considering how many things we ordered. And there was a small savings. I didn't tip as much as I usually do. We were annoyed with our waiter and his forgetfulness, but for some reason, we also felt a little sorry for him. He seemed like a nice guy, but he wasn't firing on all cylinders. I suspect the high times of a Saturday night gave way to the lows of a Sunday afternoon. If there was just a higher ideal of service in addition to the good cooking and fresh ingredients, I'd consider Da Emanuel the ideal of success. good review... on the calamary i must add they come in frozen but done like this and if u get them as soon as they are cooked, they taste really good just w salt and o. oil like u said. ... everything is frozen, of course, but if you leave the shell on the shrimp 'till the last minute, u can get that flavor..